The program supports for- and nonprofit organizations using tech to promote student success beyond the classroom. Participants receive financial support, mentorship and guidance from AT&T and other organizations. Since launching the program in 2015, we’ve worked with 19 inspiring ed-tech organizations to reach more than 12.2 million students with game-changing learning solutions. I’m thrilled to be in San Francisco this week to hit the ground running with our 2018 cohort. This year’s class comes from all across the U.S. and includes 3 nonprofits. 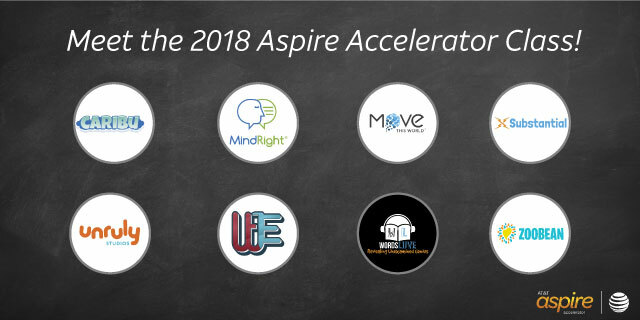 Never before has an AT&T Aspire Accelerator class championed such a diverse portfolio of leaders — a trait we believe strengthens the program. Through the programs and tools developed by this year’s class, students can learn coding while engaging in physical play with friends, increase reading engagement and even find support via text message as they recover from trauma associated with systemic oppression. Caribu (Miami) allows any trusted adult to read and draw with children, through an interactive video-call, no matter how far apart. MindRight (501(c)3/Newark, New Jersey) empowers youth of color to heal from systemic oppression trauma — including structural violence, poverty, racism and discrimination — with support via text message. Move This World (New York) uses multimedia content to develop social skills and strengthen emotional intelligence in Pre-K through high school. Substantial (501(c)3/Oakland, California) creates training, resources and information substitute teachers need to be successful. The program customizes for each school system’s unique context and delivers it online with modern, mobile friendly technology. Unruly Studios (Boston) revolutionizes learning by combining STEM education with physical play. It teaches kids how to code and gets them active. Weird Enough Productions (501(c)3/Lithonia, Georgia) teaches students how to combat fake news, identify media bias and create positive content through an ed-tech tool. Words Liive (Washington, D.C.) makes it effortless for teachers to integrate music into lessons. Zoobean (Arlington, Virginia) provides a web application, mobile app, and prospective hardware device through which families can track their independent reading and stay motivated to read. I am looking forward to working with our class over the next 6 months. We’ll explore the ways learning, technology and innovation can merge and drive transformative change and impact for students and educators everywhere.